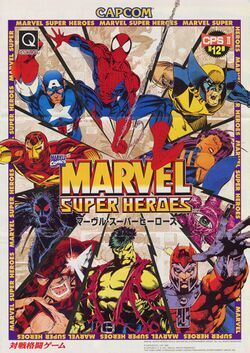 Marvel Super Heroes is a fighting game developed by Capcom. Originally released in the arcade in 1995 on the CPS-2 arcade system, it was later ported to the Sega Saturn and PlayStation. It features many superheroes and supervillains from the Marvel Comics line, including Spider-Man, Doctor Doom, and the Hulk. In addition, Psylocke and Wolverine return from X-Men: Children of the Atom, along with boss characters Juggernaut and Magneto. This page was last edited on 12 July 2009, at 11:08.